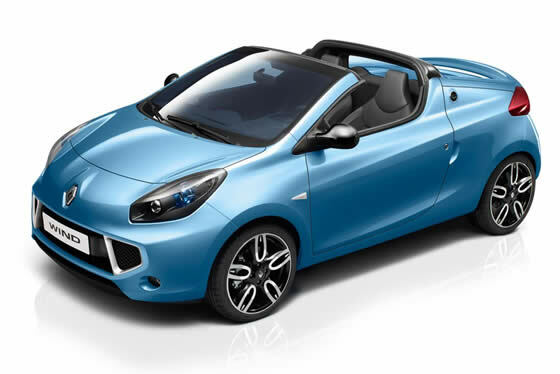 Renault have been hard at work developing two new convertibles to launch in 2010 and while the new Megane Coupe-Cabriolet will be a new benchmark in its class the Wind will be the one getting most of the attention. Quick on the draw, the Renault Wind will have one of the fastest folding hardtops in the business at just 12 seconds. This is down to the fact that it stays in a single piece rather than the folding variety seen on most hardtop convertibles. The roof is rotated through 180 degrees flipping over from its position to slip underneath the rear panel upside-down. Underneath this new two-seater coupe-roadster is based on the popular Twingo hatchback with the car’s development handled by performance and handling experts, Renaultsport. With fitment of the engine from the Twingo Renaultsport 133 on the 1.6-litre versions, buyers can be assured that Wind Coupé-Roadster will drive as good as it looks. Two petrol engines are available, the fiery and flexible 133hp 16-valve 1.6 from Twingo Renaultsport, or the smooth and responsive 1.2 TCe 100. The Wind’s roof is not a completely new innovation. It has much in common with the Ferrari 575 Superamerica – nothing to be ashamed of there. But unlike the Ferrari with was floored in that the roof lay in the open – thus emptying anything it collected on the driver. The Renault however escapes this problem by having a cover that closes over the roof tucking it safely away. The new roof also allows the Wind to maintain the same boot space with the roof up or down and saves a lot of weight in the process. The entry-level Dynamique offers impressive core equipment levels with ABS with EBD (Electronic Brakeforce Distribution), front and lateral driver and passenger airbags, brake assist, ESC, immobiliser and electric retracting hard top roof. Moving up the range to the likely best-seller, Dynamique S adds 2x35W radio CD MP3 reader with fingertip remote control, 17” alloy wheels, auto lights and wipers, Thatcham category 1 alarm, Bluetooth connectivity and multi-functional TunePoint (USB connection). Completing the launch line-up for Renault’s new compact convertible is the range-topping ‘Collection’ limited edition, offering additional luxury and style for the discerning buyer both inside and out. Its impressive equipment tally includes electrically adjustable and heated chrome effect door mirrors, carbon black leather-faced heated seats, gloss black retractable roof, red and chrome dash inserts, leather sport wheel and gearknob, aluminium pedals, subtle ‘Collection’ side and boot badges, plus double chrome roof cover cowls. In addition to the impressive equipment levels, several options should keep even the most comfort and technology-conscious buyers happy. For Dynamique models, these include 2x35W radio CD MP3 reader with Bluetooth and fingertip remote control, multi-functional TunePoint and climate control and auto lights and wipers. For both Dynamique and Dynamique S, carbon heated and leather-faced seats are available, while the latter version also has the option of ‘Camel’ tan leather seats. Metallic paint is available in black, blue, grey or red. Completing the line-up are a range of smart exterior accessories, enabling the style-savvy buyer to customise their two-door to exactly their desired look, including chrome-effect door mirrors and double chrome roof cover cowls, rear diffuser and front fog light surrounds. Customer ordering for the Renault Wind Dynamique and Dynamique S, opens in May, ahead of first deliveries in July. Renault Wind Specifications and wallpaper sized images in our buyers guide. © Copyright 2010 Convertible Car Magazine. I am very intrigued by the REnault Wind hardtop convertible. Is it available in the USA? when? You can come up with as many small coupé/cabs as is possible but no one beats the Nissan C+C (Coupé/cabriolet) in reliability, economy, price and quality. We had two C+C. I had a black one and my wife a light blue one. We never had any problems with the cars. A year ago we moved and then we just needed one car. I sold mine and now we are happy owners to just a light blue C+C. Easy driving, easy parking and all you need in a car today as a-c, abs, esp and so on. We are in our early seventies and I don´t think we will ever change car. I am sure we can easily drive the car another 20 years but then we will be in our early nineties so then we for sure have sold the car. These cars were built between 2005-2009 and ours is a 2006. 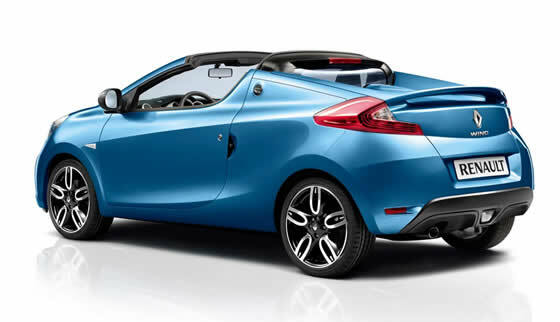 Convertible Car Reviews - The new Renault Wind Coupé-Roadster.